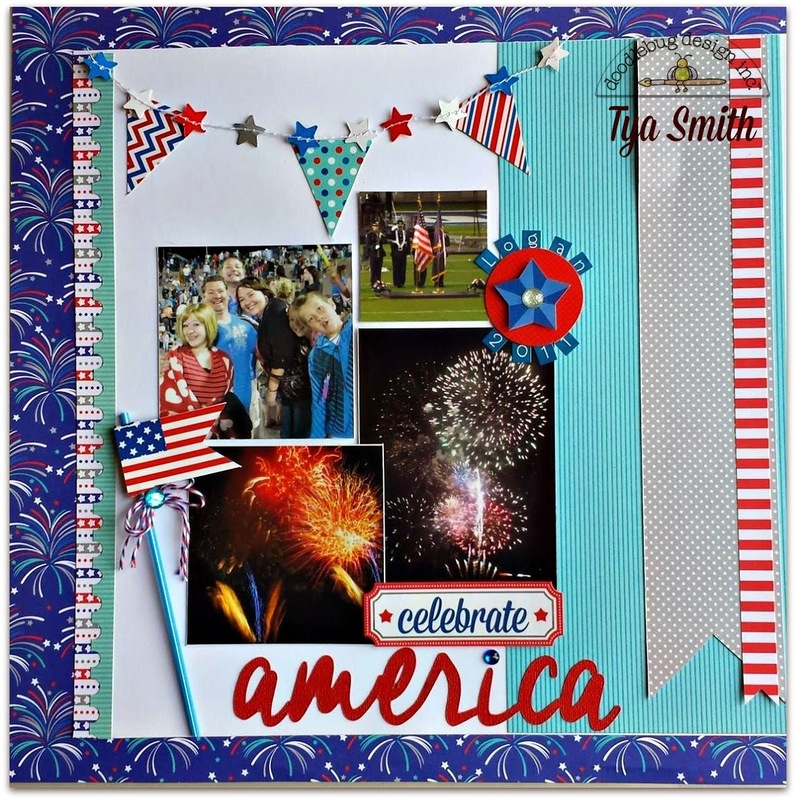 Hi everyone - Tya here, sharing with you this fun and festive Patriotic Parade layout featuring the darling Simply Put Stars and Stripes 4x6 cards and the awesome pocket style page protectors from Doodlebug Design! 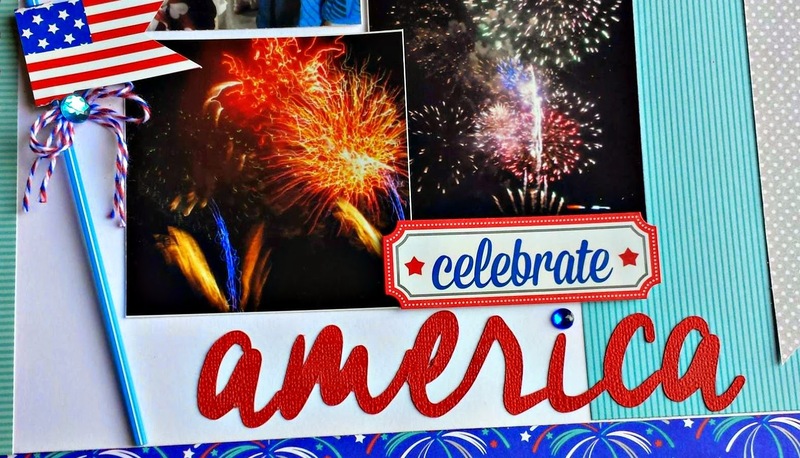 I have a confession - The 4th of July is my absolute favorite holiday! 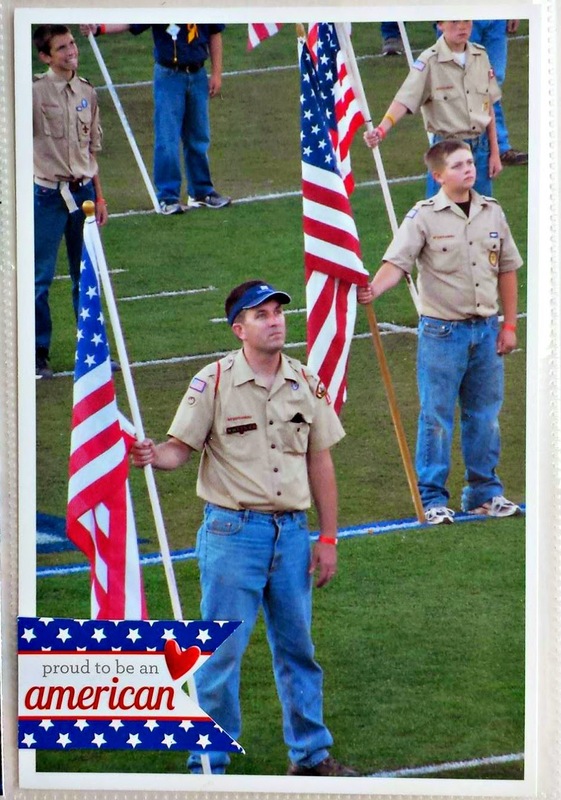 Because of that I usually end up taking oodles of photos on this holiday documenting every parade, flag and firework- so these nifty pocket style protectors and the 4x6 cards make scrapbooking these type of events quick and easy! I am always on the lookout for an awesome brush script font - I used Cheddar Jack font from dafont.com. I love this one- Definitely a keeper! Here is the pocket page-- this protector type is one of my favorites- I love the mix of vertical and horizontal photos , plus the 2 x 12 inch space on the side was perfect to highlight the darling star garland that is one of the newer products that Doodlebug came out with this year! Here are the close ups of the pocket page elements- I used lots of different embellishments such as Stars and Stripes Jewels, Red, White and Blue mini pearls, Firecracker Doodlepops, Silver sprinkles, Red, White and Blue star sprinkles,and Ladybug hearts sprinkles. Thanks for stopping by and remember when scrapbooking events that include lots of photos - reach for one of the super useful Simply Put 4x6 paper pads, and your favorite pocket page protector, and you will have darling pages in no time! Happy crafting! I love how you combined a 12x12 with a pocket page!!! Awesome idea! Oh wow! This is ADORABLE! I'm a pocket scrapper! Love the inspiration. Thank you!! I am not usually a pocket page type but I really like your layout! I like how you used a 12x12 with it! I am right there with you, love scrapbooking this holiday...so much I want to capture and scrap! 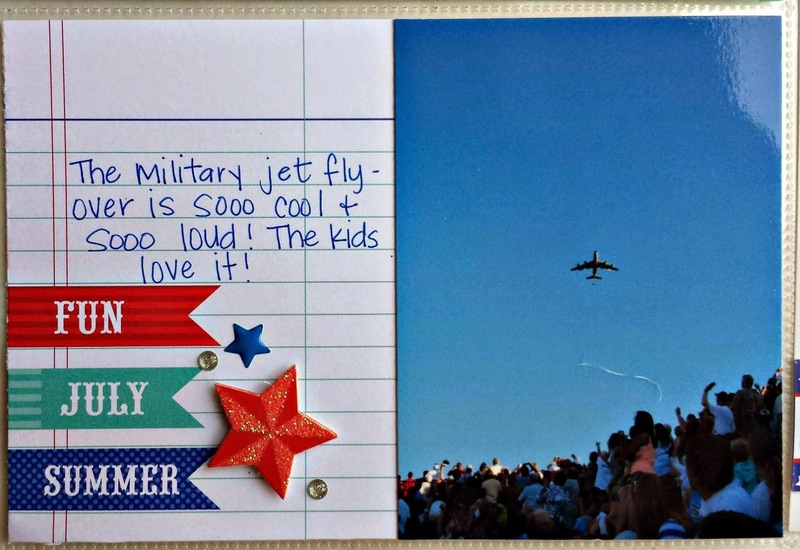 Perfect inspiration for my Summer Scrapbooking Pinterest board! Those are awesome layouts and great pictures. 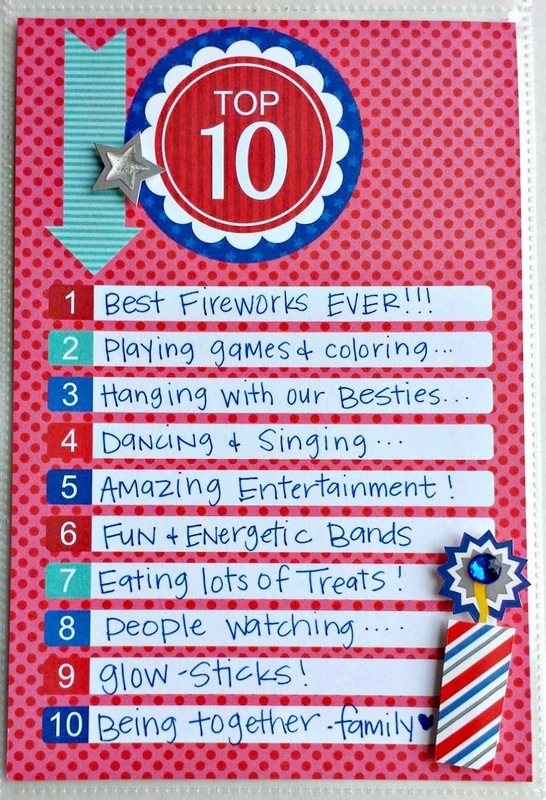 I love the top ten list! 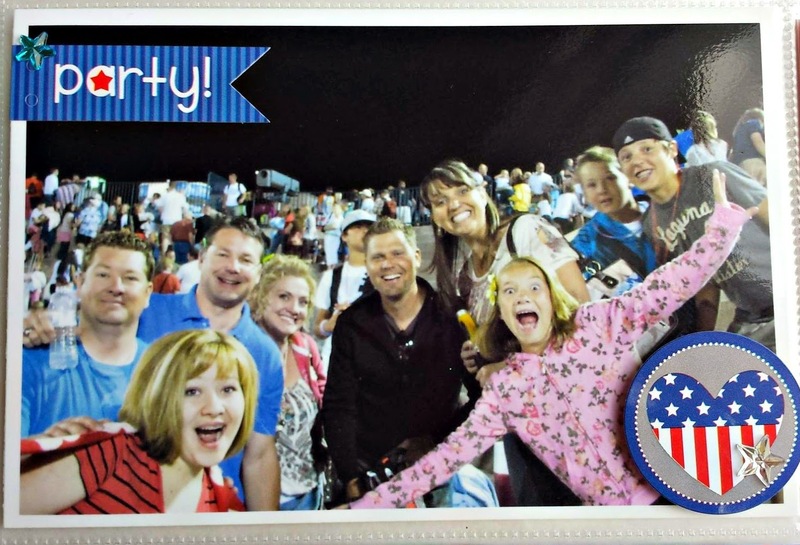 WOW - you sure have some amazing 4th of July photos Tya!!! AND you have used the best of both worlds in creating your FABULOUS traditional layout and pocket page!!! The pocket page you have used is my favourite too - LOVE the tall 2" strip and the mix of horizontal & vertical pockets. Patriotic Parade is perfect for your FUN photos!!! I pinned the pic showing both of Tya's layouts together, love the traditional page beside the pocket page!!! I pinned the close-up pic of Tya's traditional page - love the papers, mini garland, pixie, fancy frills and MORE!!! I pinned the close-up pic of Tya's fabulous pocket page - LOVE the pockets on this one, the 2x12 strip is so cool, so is the mix of horizontal & vertical pockets. 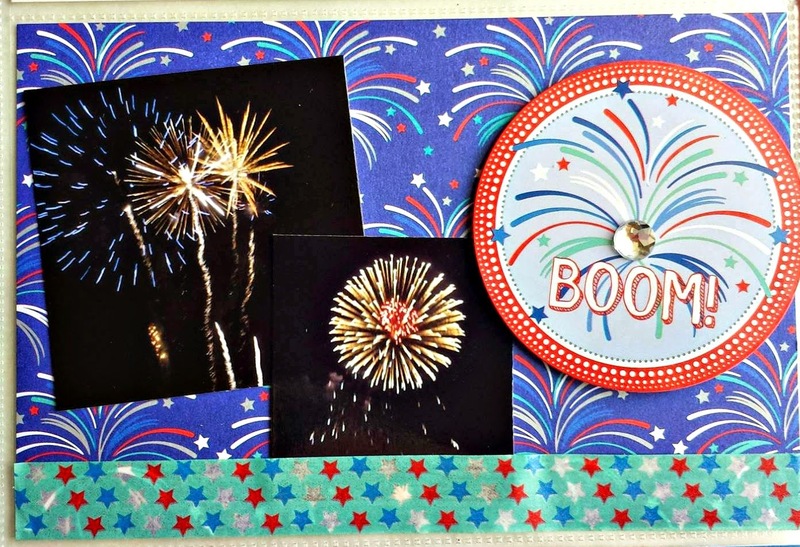 She used so many fab elements from this collection, papers, mini garland, stickers, sprinkles and last but definitely not least, the COOL "boom" fireworks sticker from This & That sticker sheet!!! I pinned the paper pack because it includes lots of papers that Tya used for her pocket layout, and the awesome "boom" fireworks sticker from the This & That stickers included in the pack - WOW!!! I have simply got to try to make that stitched mini star banner! It's beyond fabulous! 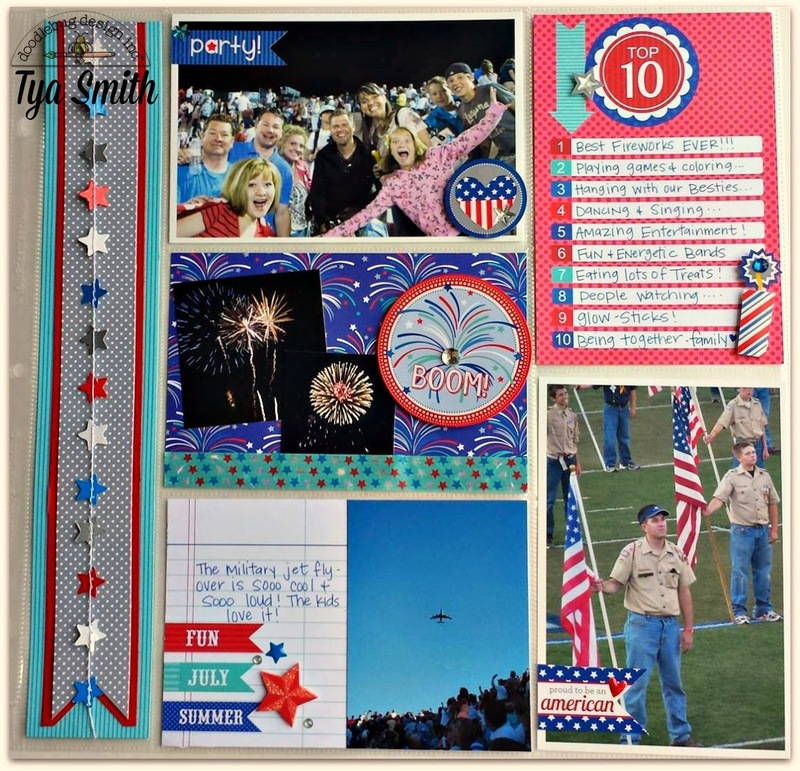 There is so much inspiration here today, I will not be hurting for patriotic ideas for a long while :) Thanks for sharing all your beautiful work Tya! Hugs and happy weekend Doodlebug peeps and friends! I love these awesome banners on these layouts!